And I think knowing and beginning to understand that fear is ultimately what brings him to the Yellow Lantern/Sinestro Corp. For those of you not familiar with the rich history of Green Lantern, when the Silver Age Green Lantern’s (Hal Jordan) run began, he was taken under the tutelage of the greatest Green Lantern at that time, an alien named Thaal Sinestro. Though Jordan deeply respected Sinestro, he was aghast at his totalitarian methods of keeping his sector in line; by acting as a dictator instead of a protector. Doing the right thing, Jordan informed the Corp and Sinestro was considered a Rouge member, banished to the Antimatter Universe. There, Sinestro met the Qward, who formed him a yellow ring to fight the GL’s, seeing as their only weakness was yellow materials. Sinestro became a staple of the Green Lantern mythos and soon, his own corp was formed. A sheer mirror image, both in practice and uniform alone, of the GLC, the Sinestro corp members are selected on their ability to instill fear rather than overcome it. The reason I chose the coward of the crew to be in the corp that brings fear, is because I think to first understand what scares people and how to successfully do it, you first must understand what you are afraid of and become it. I think Usopp has had time to do just that. 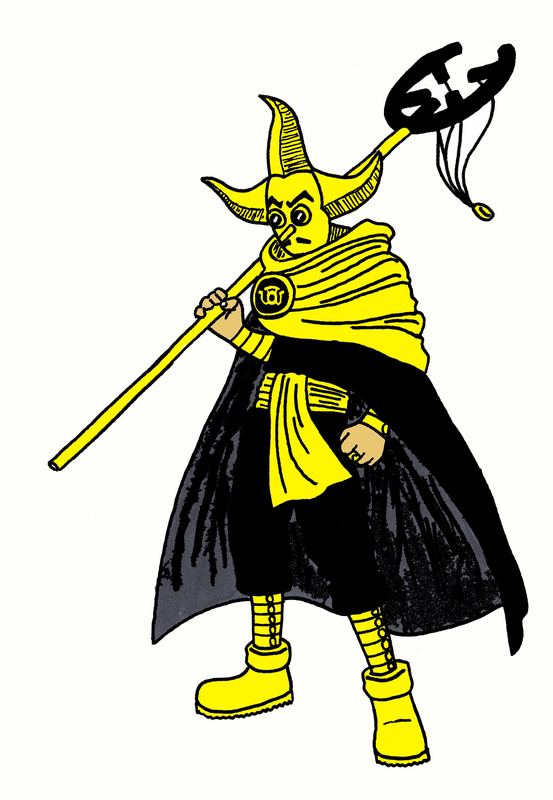 From what you can see here, there is a standard uniform to those who join the Sinestro Corp, however like my other designs, I didn’t simply want to forgo what I think makes Usopp’s Sogeking outfit so great. As you can see, I changed the mask, so that instead of being mysterious, it is a tribute to the great Sinestro (Sinestro is best known for his moustache, gaining him the nickname “Frenchy”). There is also that dynamic balance between black and yellow, creating a very science fiction look. You would not be surprised to see this outfit out in space. The yellow is also nice in this design because it isn’t overstating. Too much yellow, like in some of my other designs, can be too strong; this amount of yellow gets the idea of deceit and sneakery across perfectly. In the original SC design, the characters all have these arm and leg bands that look like stacked gold rings so I decided to keep those. They add a sense of dominance, as the color is more focused and contained than just filling in his arms with yellow.